Workplace culture isn’t something Bruce Stec takes lightly. As Vice President of Human Resources at CQuence Health Group, Bruce is passionate about developing a culture that aligns everyone within the organization toward a common cause. At CQuence, that means supporting charitable efforts, engaging in wellness-oriented activities and ensuring the central pillars of the organization are followed by everyone. Bruce leads by example. He himself has been involved in a variety of charitable organizations, and his leadership skills and philanthropic contributions have been recognized by the Omaha Chamber of Commerce. As part of the 40th anniversary class of the Chamber’s Leadership Omaha group, Bruce joined nearly 50 business leaders from around the area and spent the better part of a year learning about the Omaha community and discovering how leadership principles can be applied to solve those challenges. At the same time, he and his fellow participants got to learn about the great work being done by each other and by different nonprofits within the city. This exposure to the real issues confronting Omaha at the local level is something Bruce takes seriously, as evidenced by the map featured prominently within his office. The map depicts Omaha and has hundreds of red and blue dots pinned throughout the area, with the occasional black dot in amongst them. Having the map on the wall highlights the spread of inequality and the hard work that lies ahead for the members of Leadership Omaha and the community. Bruce has seen firsthand the difference that a handful of dedicated individuals can make, and he relishes the opportunity to engage in civically responsible initiatives and drum up support for charities of all types. 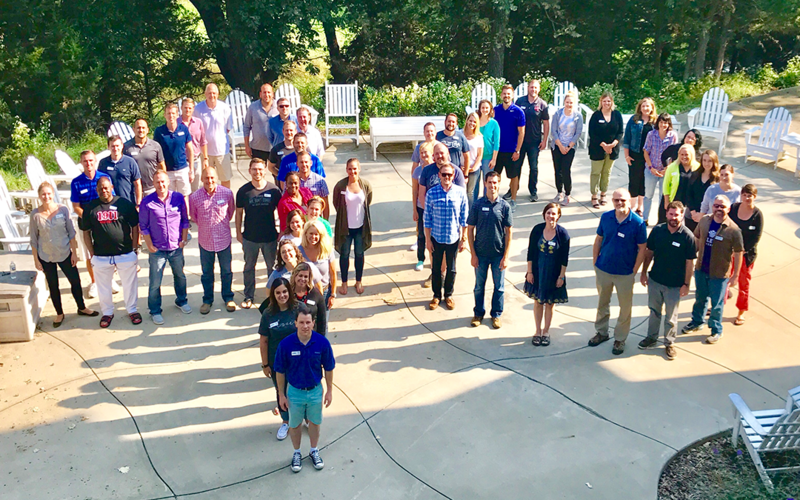 Bruce graduated from Leadership Omaha Class 40 last month, and he continues to remain invested in making Omaha a better place for everyone who calls it home. Bruce started on the Human Resources Association of the Midlands (HRAM) Board, where he eventually served as President. HRAM is an organization dedicated to providing networking and professional development opportunities to human resources professionals. He also spent time on the board of Together Inc., a nonprofit that seeks to eliminate homelessness. It was the director of Together who referred Bruce to an opportunity to join another group, one that Bruce has been supporting ever since: Court Appointed Special Advocates, or CASA, for Douglas County. CASA, like so many other nonprofits, is reliant on the kindness of donors to support their mission. And one of the ways CASA raises money is through the annual CASA 5K Superhero Run. This year, as in years past, CQuence Health Group sponsored the event and paid the registration for any CQuence employee and his/her immediately family members who signed up. In September, CASA celebrates its 20th anniversary with the “Unsung Heroes – 20th Anniversary Celebration” at KANEKO, also sponsored by CQuence. All donations will support CASA for Douglas County’s mission of giving children in the foster system a voice in the courts. Bruce appreciates the support CQuence gives to CASA and to so many organizations in the Omaha community. As head of HR, he makes sure each employee who walks through our doors understands the outsized impact they can make in the community as a part of the CQ team. Clearly, if it brings exceptional leaders like Bruce into the fold, then something is going very right. Thank you, Bruce, for all the hard work you do on behalf of the community!